InSer is celebrating 24 years as the largest and most recognized fertility center in Colombia. 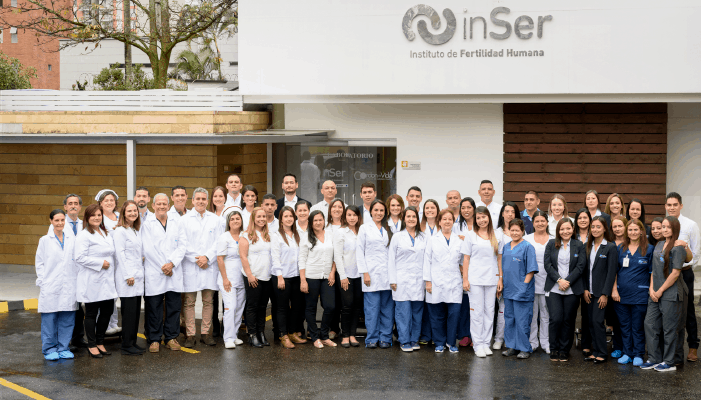 The InSer Human Reproduction Institute is celebrating 24 years of being the leader of fertility centers in Colombia and positioning itself as one of the most important fertility centers in all of Latin America. Learn more about our development in the following article. InSer will celebrate more than two decades at the service of the dreams of Colombian and foreign families in 2019, a year in which it is consolidating as the largest and most renowned fertility center in the country. And although the road has not always been easy, its team of specialists and collaborators has brought hope to more than 15,000 families that have only one desire in their hearts: to be parents. And so the dream of three Colombian doctors to found a medical center in the city of Medellín to provide services for infertile couples is today a reality that crosses the country with five branches in the main cities of Colombia: Bogotá, Medellín, Pereira, Rionegro and Cartagena. In these centers, highly trained personnel use state-of-the-art equipment to offer the necessary accompaniment to couples in order to solve their infertility problems. The 1995 dream of doctors Fidel Cano, Germán Raigosa and Natalia Posada to effectively care for infertile couples in Colombia is now a reality. After two decades of hard work, Inser is now the leader in Colombian fertility centers for possessing several accreditations that demonstrate the quality of both their human and technical efforts. With more than 80 collaborators and 12 specialists in human reproduction throughout the country, InSer offers fertility services and treatments of low, medium and high complexity for patients who require an integral accompaniment when having a baby. These treatments (which include In Vitro Fertilization, Artificial Insemination, donation and freezing of gametes, among others), are performed with the highest quality standards which leads to success rates that year after year put immense smiles on the faces of hundreds of couples who dream of having a baby. The InSer Human Reproduction Institute also has additional services such as the Psychological Accompaniment service, a pioneering program in the country where, starting from a conversation with a fertility expert from the field of psychology, couples can feel understood for their fears and doubts regarding their reproductive difficulties. Also, InSer offers, as part of its Corporate Social Responsibility program, the Supporting Dreams service, a program that aims to preserve fertility in those patients who go through the hardship of being diagnosed with cancer. In addition to accompanying patients, Inser also aims to create spaces for continuing education in order to train those who are just beginning in the area of assisted reproduction. With the Fellow program or subspecialization in assisted reproduction, InSer Human Fertility Institute has managed to train specialists and biologists in the subject of infertility, thus expanding opportunities for families seeking the support of an expert to achieve their most desired dream: having a child. Two decades of continuous work consolidate InSer as a place where the struggle and efforts of thousands of families are rewarded with the incredible gift of becoming parents. To make an appointment, click here. An InSer mother tells us about her struggle to have the greatest dream of her life in her arms today.